Remember a few weeks back when I reported that Alex Honnold and Tommy Caldwell had completed a continuous free-climb of Yosemite's Triple Crown? Apparently Honnold had such a good time, he decided to go back and do it again, this time by himself. The "triple crown" consists of Mt. 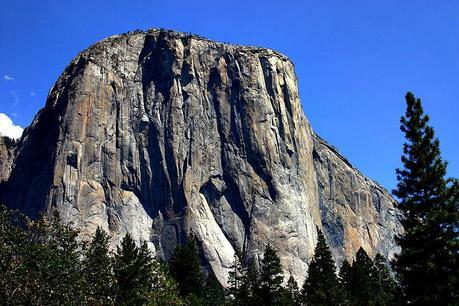 Watkins, El Capitan and Half Dome, three of toughest and most iconic climbs in North America. According to this story at Climbing.com, Honnold began his epic solo endeavor on Mt. Watkins at 4 PM on Tuesday of this week and finished up on top of Half Dome 10:45 AM the following day. That means he managed to not only scale each of the three big walls, but also travel between them, in just 18 hours of time. That shaved more than three hours off the time he did with Caldwell. The story also says that he free climbed 90% of the route, using aid on just a few occasions. He also reportedly borrowed a chalk bag from some other climbers on El Cap after he forgot his back on the ground. Honnold, who is unquestionably one of the strongest climbers in the world today, has made Yosemite his personal playground over the past few years. Last week he even went up the Northwest Face of Half Dome in just 1 hour and 22 minutes, shaving nearly an hour and a half off his previous record.